You could expect to pay £150-200 per day per person plus materials. The problem may be finding anyone interested in doing a small job like this. Would you have an idea how much someone would charge to do this? I'd try using a bolster and chisel first as the material may come out quite easily if not you would need to use an angle grinder with a diamond blade. You can get wide diamond blades specifically for removing mortar but I would try a thin blade first. 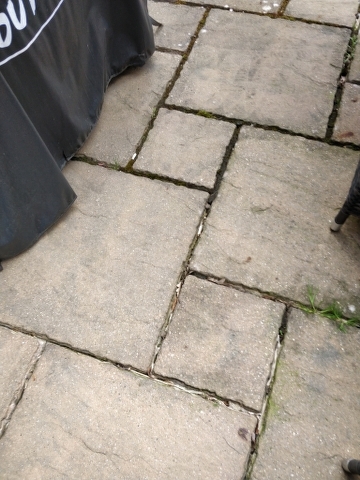 The big problem with them is cutting into the surrounding paving and making more of a mess than you have now. If you are going to use Geo-Fix then follow the instructions to the letter and you should have no staining. 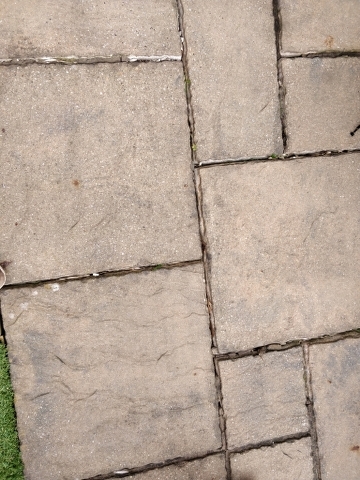 If you use cement/sand mix make sure the paving is dry and mix the mortar to a very dry consistency with just enough water to loosely bind it together, then brush off any overspill with a dry brush sweeping diagonally across the joints. If you do use a grinder make sure you have a good mask, plus ear and eye protection. Great info, thank you! May I ask what would be the best tool to remove the existing resin? Also with either the geo-fix or the cement/sand mix, will it stain the slaps if it spills onto them. Never done this before so very conscious of making a real hash of it. You will need to get all the old material out which will be quite a task. 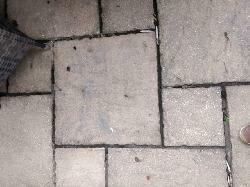 You will need to be careful as the slabs you have are concrete and if you do anything too aggressive you will expose the aggregate core. As for what to put back, the landscaper I've just been working with uses Geo-Fix paving jointing compound but he said a 1:3 cement/ sharp sand mix is almost as good and a lot cheaper. This patio was apparently pointed with a resin about 6 years ago but now is crumbling out, especially after jet washing. I need to clear out all the old resin. What is the best solution to use to repoint?